The games industry is on its Christmas break, meaning all there is to do is watch and see which games will be battling it out to become gamings’ Christmas number one in the UK. 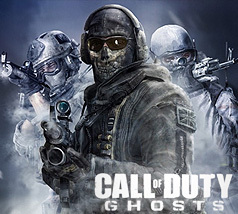 It is perhaps not too much of a surprise that Call of Duty: Ghosts is leading the charge at the top this week. It gets its third consecutive top spot and fifth week overall at the top so far, according to Chart Track as it looks to follow in the footsteps of its predecessor Black Ops II, which got Christmas number one in 2012. In fact it is the season of the sequels in the charts this week. Second in the charts is EA’s FIFA 14, which was apparently only 600 sales off taking the chart crown from Ghosts. Just behind that is LEGO Marvel Super Heroes, which manages to fly, jump, swing etc. over Battlefield 4 and Assassin’s Creed IV: Black Flag, which both slip down to fourth and fifth, respectively. Just Dance 2014 is able to make its move up to sixth whilst Need for Speed: Rivals gets its highest position since its launch as it rises into seventh. Grand Theft Auto V drops down to eighth whilst Take 2’s other Top 10 game, grappler WWE 2K14 takes ninth. Elsewhere in the charts, Dead Rising 3 is able to pull out a strong sales week, which sees it rise from 29th to 18th. The biggest rise though comes from the poorly received Aliens: Colonial Marines, which jumps 38 places to 33rdthis week. The fact that many stores have been selling it for £5 recently may have something to do with that, though. You can see the full Top 40 here. Do you think there will be many changes in the run up to Christmas, and what do you think will be sat at the top of the pile come the day itself? Are you backing a CoD Christmas or do you think there’s a dark horse in there?